Sarcostemma species, also known as pencil caustics, caustic vines or caustic bushes, are a species of succulent greyish-green bush with smooth, cylindrical stems and a milky sap. The most common species forms an upright mound up to one metre tall and one and a half metres wide. From September to June, cream star-shaped flowers occur in clusters on short stalks at joins in the stem. There are three species of sarcostemma plant native to Australia; the most common is S. viminale subsp. australe. 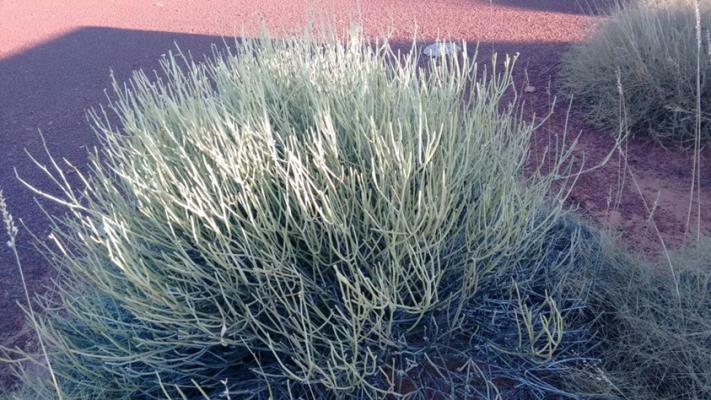 It grows in arid areas, particularly in red soils or acacia scrubs. The toxin is thought to be a pregnane glycoside found in the stems of the plant, which interferes with the central nervous system. The minimum toxic dose can be as little as a half kilogram to one kilogram of the plant for adult cattle and horses. There are historic reports of cattle having eaten the plant with no effects, so there may be variations between plants or regions. Poisoning occurs when feed is scarce and hungry cattle are forced to eat the plant. This is occurs particularly after fires, when the Sarcostemma forms new shoots before other pasture has had a chance to regrow. Young and imported stock may be more likely to consume the plant. As the toxin acts on the nervous system, the first signs are restlessness, staggering, muscle tremors and then collapse. This is generally followed by seizures, jaw clenching, paddling with the legs and side-to-side movement of the eyeballs. Death may take up to a week. There are no specific findings on post-mortem, so a diagnosis is usually made on signs and identification of consumed plant. There is no treatment for this poisoning. To reduce the risk of poisoning, prevent young or hungry stock from accessing the plant, especially when other feed in the paddock is scarce. If you suspect sarcostemma poisoning in your cattle, contact your local Regional Veterinary Officer to conduct a disease investigation. Cattle showing neurological signs may be eligible for testing under the national Transmissible Spongiform Encephalopathy (TSE) or ‘Mad Cow’ surveillance program, with a producer subsidy of $300 per animal.